The ÷ Tour (“divide tour”) is a world concert tour by English singer-songwriter, Ed Sheeran, in support of his third studio album, ÷ (“divide”). The tour started on March 16, 2017, in Turin, Italy and will end on November 10, 2018. 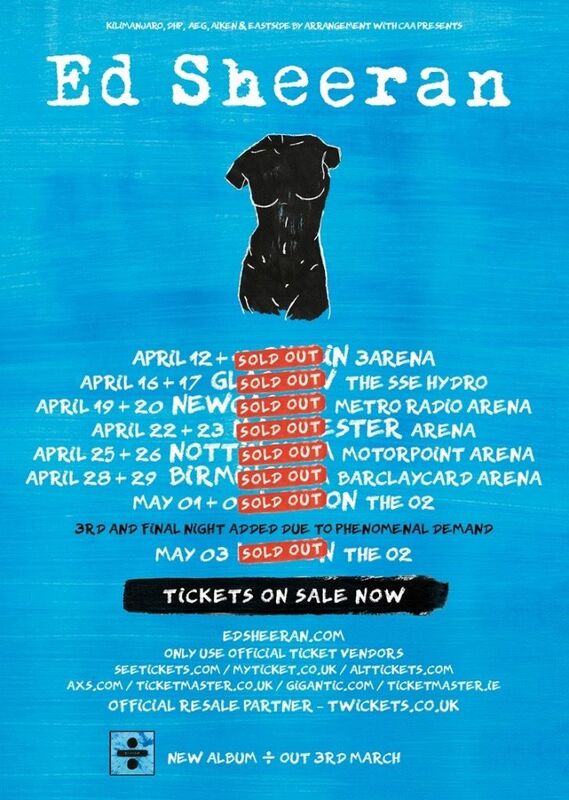 The above is the promotional art for Sheeran’s UK Tour. The font used for the Ed Sheeran logo in the poster is Mom’s Typewriter except for the letter “a” and the second letter “e”, which use the font Remington Noiseless by Richard Polt. All the other text in brush script is set in Right Chalk by imagex. If you do not want to download and install the font but just like to create simple text or logos using Ed Sheeran Tour Font, just use the text generator below. The following tool will convert your entered text into images using Ed Sheeran Tour Font, and then you can right-click on the image to save it or click on the "EMBED" button to get links to embed images on the web.